One of the features in the recently released Update 2 for StorSimple was the integration of StorSimple with Azure Site Recovery. Using Azure Site Recovery, virtual machine replication, and StorSimple cloud snapshot capabilities, you can protect entire workloads hosted on your StorSimple hybrid storage array. In the event of a disruption, you can use a single click to bring up your application online in Azure in just a few minutes. 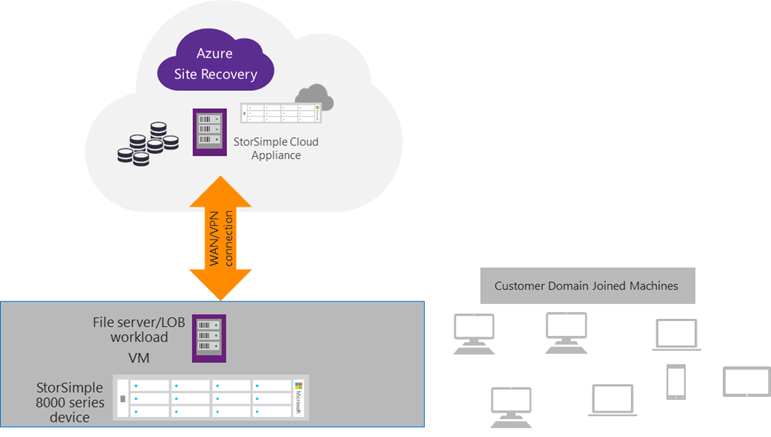 Here, your file server or any workload using the StorSimple hybrid storage array is being protected by Azure Site Recovery. StorSimple snapshots are protecting the data in the storage array. If a disaster occurs, or even for development or test scenarios, you can move your workload to the cloud. Azure Site Recovery provides planned, unplanned and test failovers. StorSimple now works with each of these scenarios. During a planned or unplanned failover, StorSimple volume containers fail over to the StorSimple cloud appliance. Your domain-joined users will continue to access the data/application. During a test failover, StorSimple volumes are cloned on the cloud appliance. You can run disaster recovery drills or development/test workloads, then bring down the setup with a few clicks after you’re done. Find more information about how to set up this scenario here.